Cold Brew Causes Less Cancer T..
Miracles Aren't Cheap: Coffee .. Anyone who has visited the Bay Area at any time since 2003 will be familiar with the name Philz. A household name in NorCal, Philz Coffee has recently been expanding—south to Los Angeles and all the way east to Washington, DC. The most recent opening is its Los Angeles location right in the heart of Hollywood. Philz’s Hollywood opening in mid-April—the company’s third in Los Angeles after Downtown LA and Santa Monica—marked its 31st store overall. If you’ve been to more than one Philz location, you’ll have noticed that every store has a bit of a different vibe. “Every location looks and feels like the community we’re in,” Race tells me. Located right at the base of the CNN building on Sunset Boulevard, Philz Hollywood is a large space with tons of seating. Yes, that’s a painted “Hollywood” sign with photos of the Philz baristas below—that’s part of what Race calls “the funkiness of Philz.” The ceiling above the POS/pastry area features circular lights, inspired by Hollywood marquee light bulbs, while pops of yellow throughout the store emphasize the cheery space and play up the natural light from the floor-to-ceiling windows. There’s lots of stuff to order at Philz; this is not one of those newfangled minimalist cafe menus. 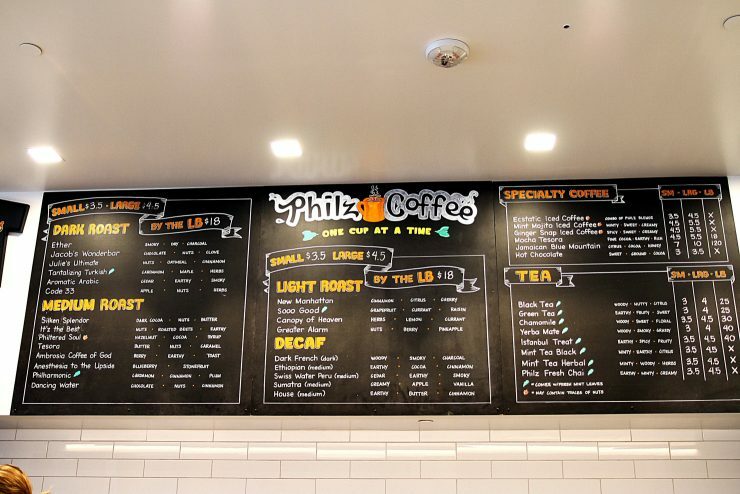 Different coffees, roast levels, and accented flavors—this is the Philz Coffee experience, where the baristas’ mission is to “better people’s days.” There are no fewer than 30 different coffees on the menu at this location, including Dark Roast and Decaf options. Most small roasting companies don’t sell thirty different coffees in a year. There are no espresso drinks here, and, no cold-brews, just pour-over hot coffee (all blends, no single origin beans) and teas made to order with their secret, personalized Philz brewing system. A single barista will take care of your order from beginning to end. You specify the roast, the blend, the type of milk you prefer (they also carry almond and soy), whether you want it iced or hot, and the sweetness level—you can choose from sugar, brown sugar, stevia, Splenda, Sweet’n Low, or honey. After your first time, you’ll get the hang of it. If you’re overwhelmed, you can just go with one of their specialty drinks, like the customer favorite Mint Mojito. Coffee purists might cringe at the above barrage of sweetener options, but people love this stuff. Philz’ ongoing success in the Bay Area, and now here in SoCal, is a testament to the success of this particular cafe model. You might not dig sugar in your brewed coffee—or be interested in an entire menu subheading of Dark Roast—but the packed, happy clientele at Philz begs to differ. All Philz Coffee locations also carry pastries sourced from a local bakery. At the Hollywood location, you can get Larder Baking Company pastries, like croissants and scones, or gluten-free and vegan options from Rising Hearts Bakery. In the very near future, Philz already has sights set on other nearby communities: Pasadena, Glendale, and Huntington Beach are next on the list. After conquering Southern California, where to next? Philz is an undeniable American coffee success story, one that isn’t slowing down anytime soon. After all, if you can make it big in Hollywood, you can make it anywhere. Philz Coffee is located at 6430 Sunset Boulevard, Los Angeles. Visit their official website and follow them on Facebook, Twitter, and Instagram. Tatiana Ernst is a Sprudge staff writer based in Los Angeles. Read more Tatiana Ernst on Sprudge.